I feel like a little kid. "It's dead anyway, Mom. I might as well take it apart and see what's inside!" Of course my Mom was always fine with this idea. "Oh neat! Here, use my little sewing scissors. They're nice and sharp so you can do a good job. Be sure and show me what you find!" Well, I was never able to show her stuff like this...until now, that is. Mom, this is the back side of the left mandible of a paper wasp. This is like the last thing a caterpillar might see, just before it gets converted into food for the baby paper wasps. Then after I got it loose I needed to get it mounted and cleaned. That part wasn't so bad, just the usual tiny tedium, ending up with the thing glued to the end of a "minuten pin", 10 mm long and 0.15 mm diameter. I was feeling pretty good right then, but that was before I started to arrange lighting. Good grief, this thing is shiny! Half a ping-pong ball just didn't do the job. I had to wrap the thing in a cylinder of tissue and make sure the whole cylinder had some light on it. Even so, portions of this thing look almost pitch black. I suspect those are distorted reflections of the lens aperture. Finally I had a stack in hand, and I figured from there on things would be a piece of cake. Hah! Did I mention this thing is shiny? What I didn't anticipate (duh...) is that it's so shiny there were large areas with precious little detail for the stacking software to latch onto. I won't bore you with a blow-by-blow replay of my thrashings around. Suffice to say that by the time I was done, I had tried every option available in both Zerene Stacker and Helicon Focus, and I wasn't completely happy with any of them either alone or in combination. What you're looking at here is mostly ZS PMax, plus bits of DMap. But I still had to clone out the last of some halo using Photoshop. 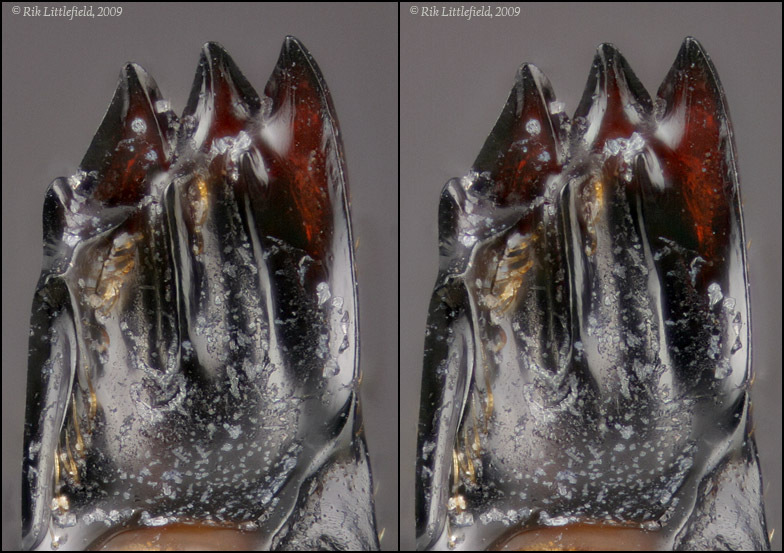 Anyway, you saw it here first: the back side of a paper wasp mandible. It looks nothing like the front side, by the way. See HERE for comparison. Technical: Canon 300D, Nikon CF N Plan Achro 10X NA 0.30 objective on 170 mm extension, 61 frames at 0.00033" focus step (8.5 microns). Dual fiber halogen illuminator with kleenex tissue diffuser, 0.6 seconds @ ISO 100. I'm not sure the result was worth all the work. I want to assure you it was worth the effort. The picture documents the morphology very well, and the overall appearance reminds me of such glossy advertisement brochures for cars. Well, "Vorsprung durch Technik" is what made this photograph possible as well. This reminds me of then time when I described a new species of collembolan. 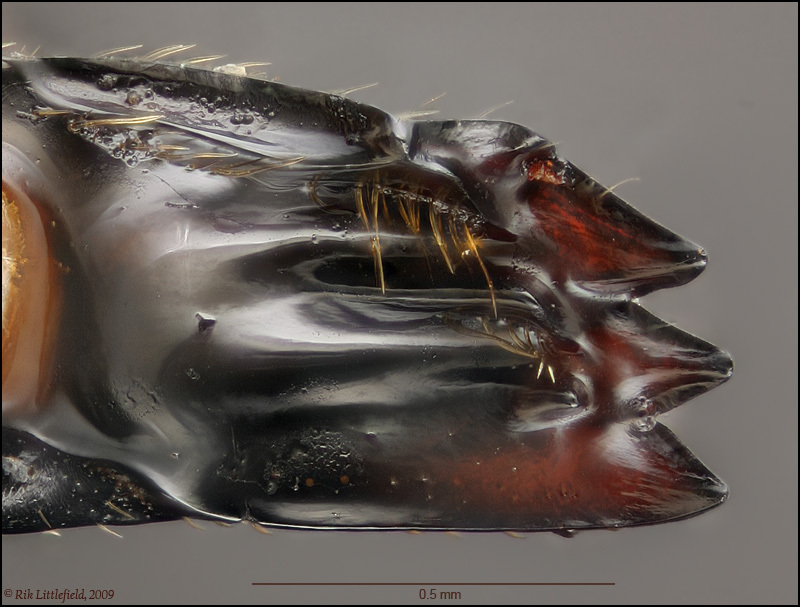 There was only one specimen and the specific characters were the finely-divided shapes of complexly-structured mouthparts on three +/- parallel planes. Compared with the dissection required, making the drawings (phase contrast and oil immersion) was a nightmare. What RL fov does this represent, Rik? Thanks for the encouragement, folks. Betty, it was the morphology that I really wanted to capture on this thing. My first thought was to do a stereo pair of it. But when I prototyped that using two single shots, I was not at all happy with what I got. The thing is so shiny that mostly what appeared were massively different reflections that were just confusing, not helpful. Quite frankly I'm still not sure what the structure of this part really is. puzzledpaul, the visible portion of the mandible is almost exactly 1 mm long. I have added a scale bar to the photo. You might have to refresh your browser to see it. This thing looks almost like polished obsidian! Thanks, Laurie. Yes, the red cast is light coming through from the background. And now for your amusement, here's a stereo pair, crossed-eye. Normally I like my specimens clean. But sometimes debris makes things better. Not just any debris, of course. What I wanted in this case was nice, fine, evenly dispersed debris -- something that would sit on the surface providing some detail for the eye to latch onto. Finding the right kind of debris is surprisingly difficult. When you're essentially working through a 100X scope, most "dust" is just too big. It's also nice if the debris is easily removed, and if there's a solvent involved, it shouldn't attack the mounting glue. I tried several approaches that didn't work, before finding one that did. What we have here is ordinary table salt, evaporated from a dilute solution, roughly 1/2 teaspoon per cup. The application method was to dip quickly and dry with heated air, repeating several times until what seemed like the proper amount had accumulated. This stereo pair works pretty well for me. I can now see clearly that there are a couple of strong central ridges. In addition to the stereo, it helps to know that more crystals accumulated in the grooves, leaving the ridges still quite shiny. Technical: 6 degrees of stereo separation, shot as two stacks, 0.0005" focus step. ZS PMax, mild retouching of the stereo pair in Photoshop to eliminate the worst of confusing reflections. Subject prep - have you though of just getting some very hard mineral water and dipping it in that and letting it dry ? Might be enough salts deposited to just give enough surface key ? That's unfortunate. The stereo really does help a lot for getting strong impressions of shapes. I wonder if you've considered getting a stereo viewer? There's quite an assortment of possibilities listed HERE. I'm very fond of the Wheatstone viewer. Take one of these crossed-eye images, copy/paste it into the StereoPhoto Maker software, push the "Swap Left/Right" button, and look at it through the Wheatstone viewer. Get the thing adjusted right, and the 3D pops out just like you were looking at a solid object. No eyestrain at all. This is the way I show other people my stuff when they're sitting at my screen. Sure -- I grew up with water so hard that a cup of coffee would skim over. Hard water is what the salt simulates. Advantage of salt is that it's a lot easier to prepare and to remove. Disadvantage is that it might not make as uniform a layer. But that's definitely a might not. I've never looked through a 100X scope at hard water scale deposited on shiny chitin. It might be pretty blotchy too. One thing about the salt, it really does have to be dilute. I started off with strong stuff, and my first attempt ended up with a couple of large salt crystals nestled in the middle of the mandible, like a couple of big dice sitting in your hand. Another promising idea that didn't work out very well was baker's yeast suspended in water. Where the yeast separated into individual cells the results looked good, but there were too many big clumps and I didn't have any filters suitable to get them out. I also tried sugar in 70% isopropyl alcohol, thinking that would evaporate faster than straight water. What a disaster! The stuff didn't crystallize at all. I ended up with a thin layer of transparent goo. Fortunately that was on a glass slide, which I was using to test everything before risking the mandible. One thing I thought about trying was a bit of plastic dissolved in solvent. But since it's plastic that's holding the mandible on the mounting pin (cyanoacrylate glue), that seemed a bit too risky. I didn't even bother to test that one on glass. Bingo! It took me a long time to figure that out even working interactively under a stereo scope. Confusing reflections off all those shiny surfaces. But with the added surface texture and the stereo display, it pops right out. An interesting challenge in "scientific illustration" --- recalling one of the more challenging classes I ever took. Nice pics Rik! I especially like the stereo pair. As for the debris, try a dusting of lycopodium powder. I`m not 100% sure its going to be fine enough for your use, but its worth a try. Thanks for the compliments and suggestion, Roadwart! As for the debris, try a dusting of lycopodium powder. I thought about using some kind of spores or pollen, but I didn't have any handy. From checking SEM pictures on the web, I gather that lycopodium spores are about 30 micron diameter. That makes them a bit larger than the biggest salt crystal sitting on the side of that upper left tooth. Seems a bit large for my purposes. On the other hand, there are some mushrooms that drop white spores. If those were the same size as the black ones that I've imaged in macro BEFORE, they'd work great. That's assuming I could get them separated from each other, and adhering to the subject. Lots of challenges in this problem!